After Freedom Industries so kindly donated 10,000 gallons of Crude MCHM and PPH into the Elk River last month, tainting the water supply for more than 300,000 West Virginians, Governor Earl Ray Tomblin made it perfectly clear that the coal industry had nothing to do with the chemical spill, despite the fact that Crude MCHM is used to facilitate the efficient cleaning of coal. At a press conference just a few days after the spill occurred, Tomblin stressed the idea that coal was not to blame, saying with regards to Freedom Industries, “This was not a coal company, this was a chemical supplier, where the leak occurred,” adding that as far as he knew, “there was no coal company within miles.” The fact that the Crude MCHM manufactured by Eastman Chemical and stored in Freedom Industries substandard holding tanks was designed specifically to make the coal cleaning process more effective notwithstanding (1), one could make a very weak argument that the Coal Industry was not involved in any of the malfeasance that led to the poisoning of the water supply in nine different counties last month. At least you could have made that argument before 7:42 this morning, when the Patriot Coal-owned Kanwha Eagle Prep Plant announced that a leak had been discovered in one of their slurry lines, and that a significant amount of coal slurry–the toxic half solid/half liquid waste byproduct of the coal preparation process–had spilled into Fields Creek, just outside of the town of Winifrede, WV in Eastern Kanawha County. The spill had taken place at some point in the early hours of the morning and was discovered by the plant’s staff at 5:30am, at which point they turned off the pump that was moving the the slurry from the plant itself to the impoundment where it is stored. Initially, plant employees and officials didn’t know exactly how much slurry had leaked into the creek, but any hopes that the damage was minimal were dashed by mid-afternoon, when officials with the state’s Department of Environmental Protection had determined that the amount of slurry that had leaked from the plant was in excess of 100,000 gallons. 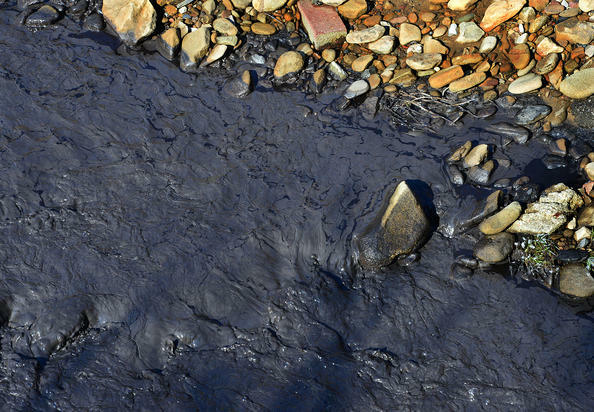 Almost immediately after word of the spill had spread to the media and general public, local news stations were airing live video of Fields Creek, which had turned into a river of opaque gray sludge. A screen capture from a report filed by Charleston’s ABC affiliate. By the time they reached Fields Creek, the water was no longer black, but gray. So, let me get this straight: more than 100,000 gallons of coal slurry leak out of a processing plant in the dead of night, proceeding to turn a creek that feeds into the Kanawha River into a burbling stream of groundwater seeping black muck, just one month after the same region’s water supply was infused with 10,000 gallons of a chemical, MCHM, which is but one of the myriad toxic substances making up industrial mess that has caused the air in Kanawha County to once again reek of fetid licorice and you, the man charged with the task of coordinating the statewide response to emergencies such as this, say that this turned out not to be a big deal? Welcome to West Virginia, where this behavior is totally normal. (1) 4-methylcyclohexane methanol is only one of six chemicals that makes up the composition of Crude MCHM, although it does constitute the bulk of the mixture. According to Eastman Chemical’s Safety Data Sheet, published in 2011, the other 5 chemicals involved in the creation of Crude MCHM (along with water) are 4-(methoxymethyl)cyclohexanemethanol, methyl 4-methylcyclohexanecarboxylate, dimethyl 1,4-cyclohexanedicarboxylate, methanol and 1,4-cyclohexanedimethanol. The original patent that was filed for the chemical, titled “Process for coal flotation using 4-methyl cyclohexane methanol frothers,” lists 4 different compositions for MCHM which include all of the chemicals except 4-(methoxymethyl)cyclohexanemethanol, instead using monoether (& monoester) of 4-methyl cyclohexane methanol. To be honest, most of this is absolute Greek to me, but perhaps someone else with a background in chemistry can make more sense of it.